Click over the image to enlarge it. Achieving temperatures, which are colder than the coldest natural environment known in deep space, requires liquid helium which has a boiling point of -269 Celsius (4.2 Kelvin). Because of its low boiling point, liquid helium is used in applications where extreme low temperatures are required. One key to the success of Omni cryogenic PCBs is the superconductive material; aluminum, paired with copper-plated traces for conventional soldering and thermal conduction, and aluminum bonding pads to enable reliable mono-metal wirebonding. Beyond its other characteristics the critical temperature for our aluminum alloy to superconduct is 0.5 kelvin making it suitable for cold temperature applications. Manufacturing low temperature PCBs with aluminum raised a number of challenges, as aluminum is an amphoteric metal which reacts to both acids and bases. Few of the conventional processes used to produce copper printed circuit boards can be used. In addition, when aluminum is exposed to air, a thin surface layer of aluminum oxide is immediately formed. While this layer is valued for corrosion resistance, it provides challenges to electroplating, soldering and wirebonding. Developing a world class technology presents many unique challenges. From Omni’s perspective, developing aluminum trace printed circuit boards was the result of one customer believing we could deliver a superconducting aluminum printed circuit board. These Al-PCBs are an integral component in a device which has the potential to change all our lives. Technology development takes talent, perseverance and luck. 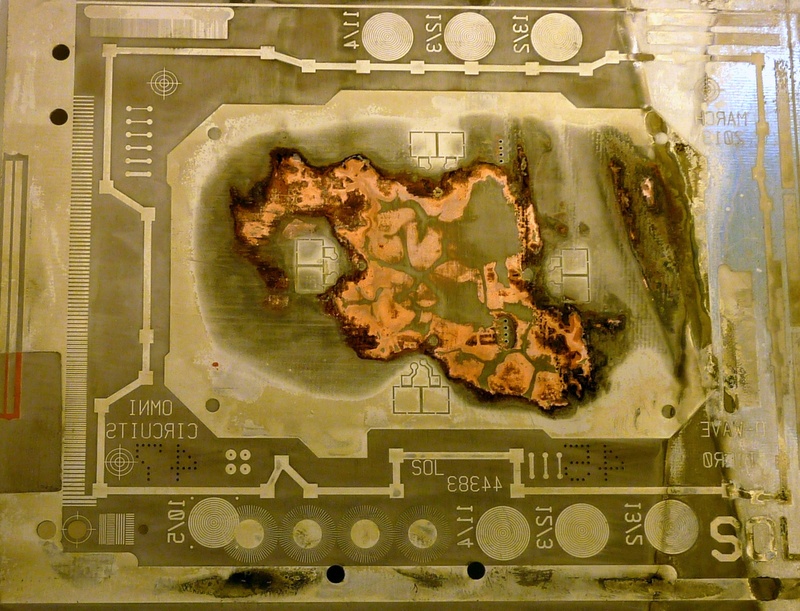 Early attempts at aluminum trace circuit boards produced black, charred panels which resembled a poorly executed wood-burning kit project of the seventies. The first visually appealing samples featured a 0.020” pitch and resulted in line reductions of between 0.002” and 0.005”. Advances in Al-PCBs often came as the result of an inadvertent error. For example, early in the development, we would pause the process after each step and closely examine every feature of the test piece. By the end of the process, we often were missing whole traces, hidden in the mass of tortured metal. We were running late one night and pushed a sample through the processes in rapid succession. The result was astonishing and it was our first breakthrough. We have since determined which steps must be accelerated. In another example, we mistakenly reversed the image polarity which later provided us with a key to finally unlock the challenge of producing fine line aluminum traces. Like all good science, our successes came from a careful, methodical design of experiments which would test a range of variables combined with keeping an eye out for serendipitous discoveries. At the time of this writing, we have developed Al-PCBs with .010” pitch, selective copper plating and low resistance PTH. The current technology state of low temperature PCBs can be found within our Al-PCB design guide. We have shipped Al-PCBs to many of the world’s most prestigious R&D facilities. What’s next depends on our customers’ needs as they continue to drive development of Omni low temperature superconductive PCBs.